Apple will provide an easier and integrated way to create screencasts for iOS apps with the upcoming iOS 8 and Yosemite software updates, using a Lightning cable and QuickTime Player on OS X. As reported by Benjamin Mayo at 9to5Mac, the feature is primarily meant to let developers create App Previews for the improved App Store launching with iOS 8, but it’ll also come in handy for users willing to capture videos of iOS apps for screencasts, reviews, and other video content. In a technical document, Apple describes App Previews as “composed primarily of device-captured footage of your app to help customers make more informed download decisions”, and they will be available in the new App Store client for iOS 8; Apple started experimenting with “app trailers” last year, and all registered developers will be able to record and submit their videos through iTunes Connect later this year. With iOS 8 and OS X Yosemite, you can capture real-time footage of your app directly off your iPhone, iPad, or iPod touch. Just connect your device to your Mac using the Lightning connector and it will be automatically available as a video camera. You can capture anything you’re doing on-screen directly to your Mac using QuickTime Player. Edit your captured footage in your favorite video editing app and upload it iTunes Connect—just like your screenshots—to submit it for review along with your next app update. 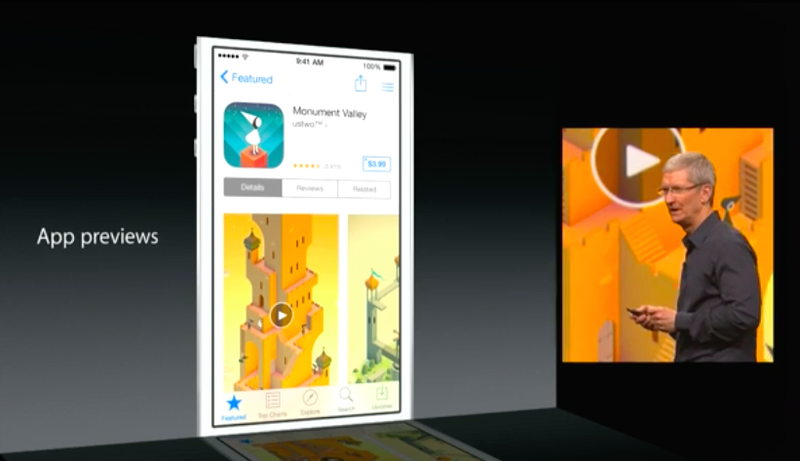 App Previews will be device specific, and they will require an iPhone (or iPod touch) with a 4-inch Retina Display (no iPhone 4s) or an iPad; they will only be available on iOS 8’s App Store, and developers will be able to “submit a single set of App Previews designed for iPhone, iPod touch, and iPad against one language localization”. App Previews will be a great addition to the App Store, which has so far been limited to static images that can only convey a limited amount of information about an app. Especially after iOS 7 and Apple’s focus on motion and context, videos are the best way to understand an app’s flow and feature set; including them into the App Store means developers will get a more prominent spot to advertise their videos without requiring users to follow links to YouTube or Vimeo. For general-purpose screencasts, integration with QuickTime and Yosemite should remove the need for video recording over WiFi through AirPlay using third-party OS X apps. For reviews I publish on MacStories, I’ve relied on a combination of AirPlay and Reflector to mirror an iOS device’s screen on my Mac and record a video off of it; Apple’s solution appears to be more elegant, simpler, and theoretically free of AirPlay lag and other video artifacts. Other hardware solutions to capture footage from iOS devices existed before, but they were expensive and required additional equipment. Apple’s document on App Previews is available here; 9to5Mac has a screenshot and first impressions of the recording feature in QuickTime Player for OS X Yosemite.